KEYRUS | "The omnicommerce battle is above all one of customer insight"
"The omnicommerce battle is above all one of customer insight"
Interview with Eric Chemouny, Senior Vice President Customer Engagement and Commerce EMEA at hybris SAP. Interviewed by Stephan Samouilhan, Vice President Keyrus Digital at Keyrus. Stephan Samouilhan : Omnicommerce, is it an emerging concept or already a reality? Eric Chemouny : "All you have to do is observe the behavior of consumers, notably of the youngest amongst them, to understand that it is clearly a reality! For the consumer in 2015, whether he is in Europe, Asia or America, the market is resolutely global and the distinction between physical and digital channels no longer exists. The consumer moves from one to the other along the way, is as likely to buy goods in the local shops right next to his home as he is from sellers located on the other side of the world, and whatever he does, he expects his seller to know him, recognize him and offer him things that interest him. If an enterprise wants to capture and a fortiori retain a consumer like that - versatile, over-solicited, demanding and impulsive - it is essential to have an omnicommerce strategy; and, of course, the technical infrastructure to support it over time". 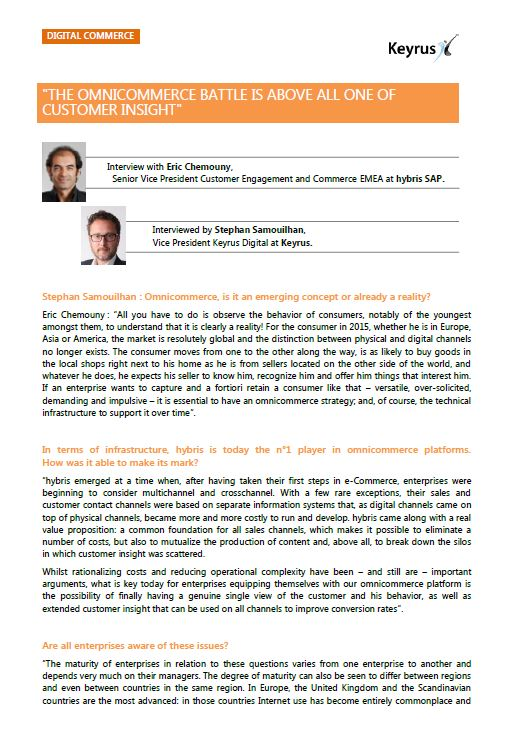 In terms of infrastructure, hybris is today the n°1 player in omnicommerce platforms. How was it able to make its mark? "hybris emerged at a time when, after having taken their first steps in e-Commerce, enterprises were beginning to consider multichannel and crosschannel. With a few rare exceptions, their sales and customer contact channels were based on separate information systems that, as digital channels came on top of physical channels, became more and more costly to run and develop. hybris came along with a real value proposition: a common foundation for all sales channels, which makes it possible to eliminate a number of costs, but also to mutualize the production of content and, above all, to break down the silos in which customer insight was scattered. Whilst rationalizing costs and reducing operational complexity have been - and still are - important arguments, what is key today for enterprises equipping themselves with our omnicommerce platform is the possibility of finally having a genuine single view of the customer and his behavior, as well as extended customer insight that can be used on all channels to improve conversion rates". Are all enterprises aware of these issues? "The maturity of enterprises in relation to these questions varies from one enterprise to another and depends very much on their managers. The degree of maturity can also be seen to differ between regions and even between countries in the same region. In Europe, the United Kingdom and the Scandinavian countries are the most advanced: in those countries Internet use has become entirely commonplace and distributors have understood for several years now that they had to offer the possibility of moving easily from one channel to another to make purchases. For example, they have been operating Click & Collect services for a long time now. Germany is doubling its efforts, followed by France, where there is a tendancy to think about things for a long time before taking action. The southern countries (Spain, Italy, Turkey) have got off to a strong start. In the United States, omnicommerce is almost self-evident. With their pragmatic attitude, the Americans were quick to understand that they had to adapt information systems to avoid losing customers. Brazil is moving forward on the subject and China is making very fast progress, with an enormous potential: that part of the population that uses social networks is greater than the total population of Europe and, despite the weaknesses in the networks, mobile is asserting itself as the preferred channel for making purchases". Do enterprises that sell B2B face the same issues as retailers ? "Fundamentally, yes. Moreover, as a market B2B is potentially three times bigger than that of B2C. It is less mature but is seeing strong growth, notably due to those companies that had traditionally used paper catalogs turning to omnicommerce. The problem issues are similar to those of B2C, with not shops but agencies, and channels that are just as various and varied. The main problem in B2B is that a product has no price in absolute terms, but rather a price for each customer, depending on volume considerations and negotiated specific terms. To truly undertake e-Commerce in B2B, you need technology and an information system that allow you to manage customer pricing individually. The other trend is the boom in B2B2C, with companies discovering that they can embrace non-professional customers without adversely affecting their professional clientele. Marketplaces of B2B sellers are currently being set up to offer products as much to professionals as to private individuals. Here again, the digital transformation is driven by developments in consumption methods and the need for agility and productivity: in B2B as in B2C, enterprises want to create new markets and break away from anything that costs them too much in order to trade with greater speed and agility. They also want to be able to take advantage of new channels quickly. If a new channel appears tomorrow, those enterprises that already have a unified information system will be able to integrate it much more easily than enterprises that still function in silos". What pushes an enterprise to go for omnicommerce, and what are the obstacles? "What makes an enterprise move forward today is no longer e-Commerce as such, nor CRM in the traditional sense of the term. Rather, it is accomplishing that necessary process of acquiring the ability to understand its customers more effectively, make channels interact better, and open new channels quickly, without calling everything into question each time. If enterprises are hesitant, it is mainly because they imagine, wrongly, that this transformation involves a general big bang. It is nothing of the sort. It is entirely possible to start small. The redesign of an aging e-Commerce site is a good entry point. Rather than bearing the crippling cost of making specific developments to modernize it, or opting for a turn-key monochannel solution, the enterprise has everything to gain from rebuilding its site on a platform that is natively omnichannel, like hybris. This will give it a site which is not only up to date, but which also has advanced search functions and a real product recommendation engine. As a second step, the enterprise will be able to attach, depending on its priorities, the mobile channel or its network's points of sale, without having to redevelop functionalities or recreate content. This represents a major gain in terms of agility and productivity and safeguards retailers' margins which have come under severe pressure from widespread competition. Explaining this to company managers and IT teams is part of the "evangelization" work that we have been undertaking with Keyrus for five years, and we have some fine achievements together to bear out what we say!" How did you begin to collaborate with Keyrus around the hybris solution? "When, in 2010, I opened hybris in France - before Italy, Spain, Turkey and other countries including, today, China and Brazil - I came into a market in which nobody knew of this brand and in which the talk was still mainly of e-Commerce. I embraced partners whom I knew to be agile and capable of innovating. At Keyrus, my contacts - Eric Cohen, Stephan Samouilhan and Thierry Blatier - immediately grasped that omnicommerce was a very strong market trend and that the product was well designed and resolved the problem issues facing numerous clients. They saw in hybris an area for development that was highly complementary to their business lines in data, analytics and digital transformation. They started out carefully but with conviction, so much so that we very quickly signed our first deals, including, at the outset, a strategically important project for a world-renowned retail chain". What were the keys to success during these five years of partnership? "In the first instance, it was Keyrus's capacity for innovation and the human qualities and open-mindedness of its management. Above all, a partnership is about people working together on a basis of trust. That trust was established between us very quickly, and it is essential if you are to succeed in building teams that manage to work together and successfully complete large-scale projects. Also, Keyrus understands business issues and has a strong client culture and an international presence that enable it to assist international clients with the various dimensions of their digital transformation. Today, this subject goes beyond the development of information systems alone, even if that still remains the essential condition for company survival. Data is at the heart of omnicommerce and Keyrus grasped that long ago. With its in-depth knowledge of digital and over 50 client projects successfully completed, Keyrus is a partner of choice for any enterprise wanting to stay in the running in the global omnicommerce race. In that race, customer insight, and the ability to utilize it through Big Data-type algorithmic processing, will be decisive. This will be all the more true with what lies ahead in the short term: on the one hand, the boom in marketplaces, which are concentrating a growing share of trade on the other side of the Atlantic and above all in Asia; and on the other hand, the offensive led by the major platforms of social networks which, for a few months now, have been starting to offer e-Commerce functionalities. Being better placed than anyone to gather information on customer behavior, they are also de facto in a position of strength to monetize it, and they are not going to hesitate to do so!" "Lifting the constraints on omnicommerce to enhance performance and stay in the global race".